Valentine’s Day takes many forms throughout a life. In elementary school it’s hotly anticipated and tons of fun. Then in middle school and high school it becomes tortuous. Once you’ve really found a special someone, it becomes kinda sweet–picnics on the beach, Sunday drives to no where, late-night art films at a trendy cafe. At least that’s what my romance with the Sweetie Pie looked like. My friends! We can do better than this! And we’re here to help you. Plan to Eat wants you to have a very sweet Valentine’s Day celebration with your sweetie. We have a great Date Night Prize Package and it’s all going to one lucky winner! Read on! It was love at first sight. 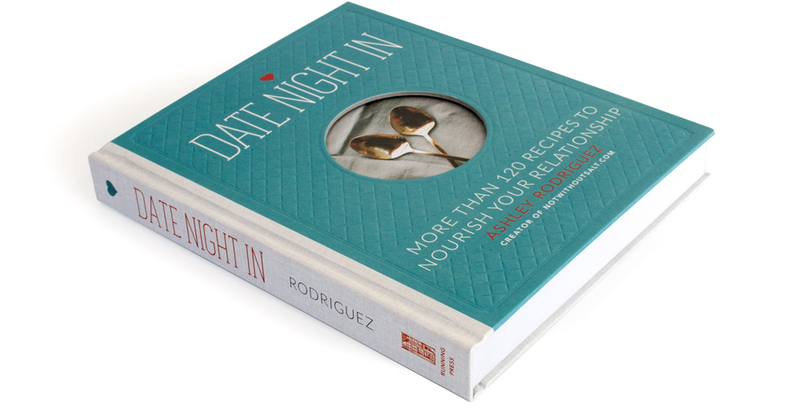 I fell instantly for Ashley Rodriguez’s book, Date Night In. From the folksy, cottage-y cover, to the sweet candid photography, to the fresh and simple recipes, she had me at hello. Ashley agrees with us that you can have kids and also have a date night with your sweet baboo, and her book makes it so easy for you to whip up special home-cooked meals for two that you’ll be planning a date night every week. Each chapter is its own date centered around a theme such as spring, birthdays, Italian, or burgers. Ashley opens each meal with a personal story from her and her husband’s experience of the meal. You might be tempted to skip over these anecdotes in order to get to the recipes, but you shouldn’t. The preludes are charming and engaging and after reading a page or two about Herb-Butter Roasted Chicken with Tarragon Aioli, you will not be satisfied to eat anything less for dinner. Each date night has at least three courses: a side dish, a main dish, and a dessert. Most of them also include a cocktail or an appetizer (or both!) But don’t worry, Ashley knows you have kids and that you don’t have four uninterrupted hours to make a multi-course meal. She has given you lots of hand-holding in the form of prep schedules and a grocery lists. These make your preparation as easy as possible, and you’ll find that much of the work can be done in advance so you don’t even have to wear your apron on date night. The recipes have lots of little tips and tricks tucked in, making you feel like you have your best friend in the kitchen with you…that is, if your best friend knows how to tell good stories and cook really good food. I had hoped to pull off an entire menu and have a date night in with the Sweetie Pie, but there weren’t any meals that fit in with my highly restrictive diet. So instead I tried out the BBQ Pulled Pork Sandwiches with Apple and Radicchio Slaw on my family. Need I even say that it was a a big hit? They even ate the slaw. What is Valentine’s Day without some sweets? But we’ve done way better for you than a dusty box of chocolates from the convenience store. We visited our favorite local chocolate makers in Old Town Fort Collins, CO. To make this sweet giveaway even sweeter, Nuance Chocolate is giving you a variety of their single origin, best-selling, chocolate bars! 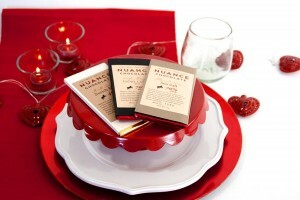 Nuance Chocolate is one of only a handful of bean to bar chocolatiers in the United States. They begin every bar with raw cacao beans carefully sourced from all over the world. Once begun, Toby and Alix control the entire process from roasting to tempering. The results are carefully crafted and deliciously…well, nuanced. 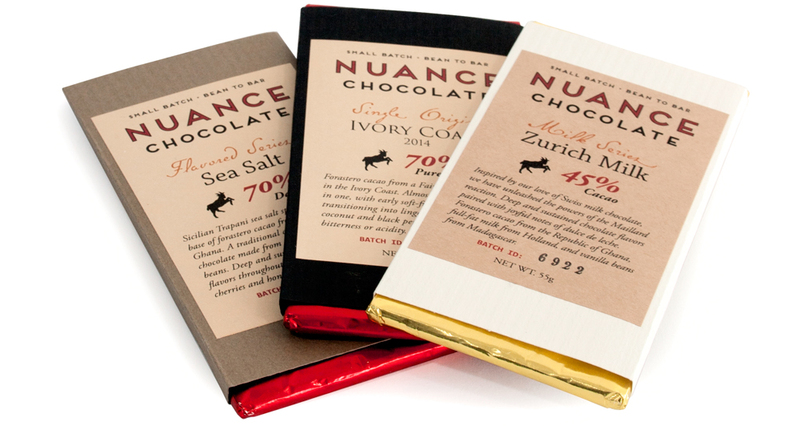 Nuance Chocolate is giving you three bars from their shop in Old Town: a Zurich Milk Chocolate Bar, a Sea Salt Dark Chocolate Bar, and an Ivory Coast Dark Chocolate Bar. You can use them to finish off your date night dinner, or keep them stashed in the cupboard to share on weeknights after the kids are in bed. Or you can hide them in your nightstand and keep them all to yourself. Chocolate? What chocolate, my love? We personally visited all of our favorite home decor stores and put together a special date night table setting for you and your sweetheart. We’ve got everything you need to make your table feel less “family night” and more “date night”. We’re giving you a smashing red table runner to set the stage, and four candle holders with candles and some fancy glittery sand, to make things a little swanky. For your meal are two cloth napkins (because disposable napkins have no place in romance), two rustic tumbler glasses, two dinner plates, and two shiny red charger plates to frame your meal. And for that special date-night touch we’re including a string of punched metal, heart-shaped lights, two soapstone hearts, and a serving pedestal that’s the perfect spot for a chocolate dessert for two. We like to gild the lily. Serve with a fresh slaw, preferably Apple and Radicchio Slaw from page 222. In a small bowl, combine the garlic, cayenne, paprika, salt, brown sugar, cumin, and yellow mustard. Stir well to combine. Rub over the pork and let sit for at least 1 hour or overnight in the fridge. In a medium saucepan over medium-low heat, whisk together the apple cider vinegar, mustard, ketchup, cayenne, salt, black pepper, muscovado sugar, garlic, and liquid smoke, if using. Bring to a simmer and cook on medium low for 10 minutes to reduce slightly and bring the flavors together. Sauce can be made ahead and stored in the refrigerator for up to 1 week. Place the pork shoulder in a large Dutch oven or roasting pan with the water. Wrap the pan tightly in foil. Roast, completely covered, for 4-5 hours, or until the meat easily falls apart when prodded with a fork. Add more water or stock while the pork roasts if it looks dry. Let the pork rest 10 minutes. Add 2/3 cup barbecue sauce to the roasting pan and scrape up any crusted-on bits on the bottom. Use two forks to pull apart the pork into bite-size shreds. If there are any tough or fatty pieces, pull those out as you shred the meat. Taste and add more sauce if needed or reserve the remaining barbecue sauce to serve on the sandwiches. Slice and butter the buns and then toast them in a hot skillet or pan. 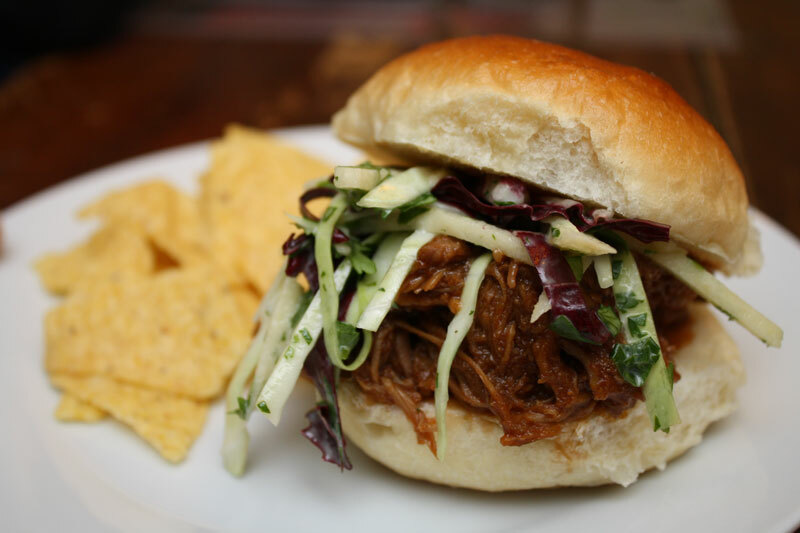 Add roughly 2/3 cup pulled pork to each bottom bun and top with 1/2 cup slaw. Finish with top buns and serve with a little extra sauce on the side.